I’m in Banff, Alberta for the annual Banff World Media Festival (see update here), and my worlds are colliding. Banff is mostly a TV centric conference/festival/market, but it is increasingly all-media focused, and this year the team at wattpad is here. As a content creator, across TV, books, and digital, this is the intersection of modern media. 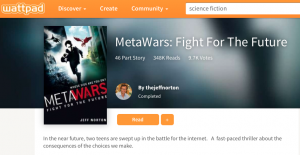 As an author, I love the wattpad platform because it enables conversations with readers. As a TV producer, I love what it can do seed stories with readers. At Awesome, we’ve started to talk to potential partners about MetaWars as a TV show, and it’s incredible the feedback that comes when people know the book has a global, digital footprint. The wattpad team was featured in Fast Company, and you can read the piece here. As a creator, tools the help bring content and users/readers/viewers together are essential, and wattpad is an exciting place to be.